Don’t let her white coat intimidate you. Behind Andi Devereaux’s impressive pharmaceutical smarts and multiple accolades from peers and professionals in the field—including a national award for her groundbreaking opioid research—there's a woman who genuinely wants to make a difference in people’s lives. The third-year pharmacy student sees a major part of her role as being an advocate for patients. And Andi is one of the best advocates a patient could hope for. 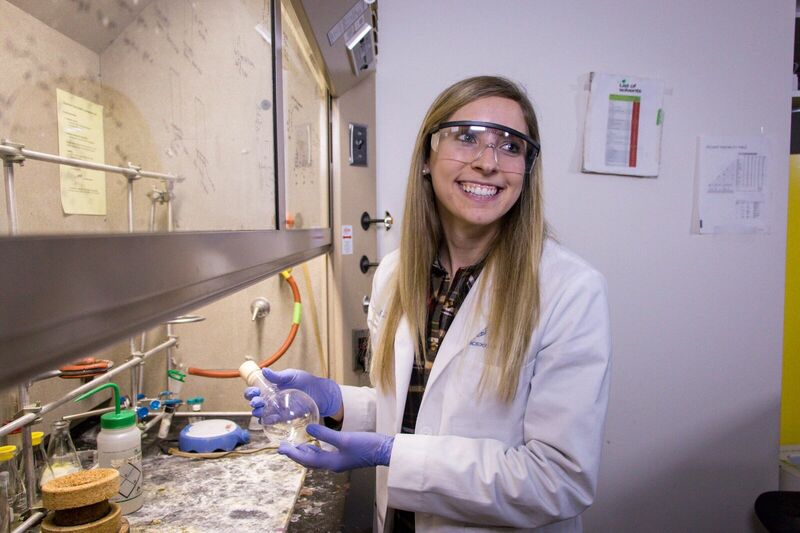 Before even crossing the commencement stage, she’s managed to earn national recognition for work she completed in 2016 under the direction of CUW Assistant Professor of Pharmaceutical Sciences Dr. Christopher Cunningham. The precocious chemist worked to improve the process to synthesize a new class of potentially non-addictive opioid analgesics. In other words, her efforts bring scientists closer to the “holy grail” of developing safer painkillers that will have a positive impact on the ongoing opioid epidemic. While these compounds are still in the early testing and research phase, her groundbreaking research holds potential to transform the way health care professionals nationwide treat chronic, severe pain. For her efforts, the Female Opioid Research & Clinical Experts (FORCE) Foundation awarded Andi and two other individuals with the 2017 FORCE Junior Investigator Travel Award. Andi now joins the elite company of women nationwide—including the director of the National Institute on Drug Abuse and the City of Baltimore’s commissioner of health—who have served the public good through their efforts in dealing with the opioid epidemic. The national crisis is a concern that is near and dear to Andi’s heart. In spring 2015, the promising young scientist learned that someone close to her had overdosed on opioids. Andi was about to begin her courses in Concordia’s School of Pharmacy at the time. She was 20 years old, and more than 300 miles away from being able to offer any kind of in-person support as her loved one first entered a treatment program and then continued the ongoing fight for sobriety. As a pharmacist, I’m the person who takes big, complex problems and breaks them down so that the patient can understand them. I’m not the type of person that should be in a dungeon analyzing compounds. Andi says she’s still evaluating options for her future after she graduates from Concordia in 2019 with her Pharm.D. degree but thinks she’ll likely end up in a community-based setting. Her love of organic chemistry, and her passion for changing the field of substance abuse and pain medication have led to extraordinary outcomes. Concordia has afforded Andi and countless others the opportunity to use their uncommon gifts in service of others.